When woodworking plans call for cutting curves in thick stock, typically the tool of choice is the band saw. Band saws can be easily adjusted to accommodate most thicknesses of stock, and the blade stays straight throughout the cut (a challenge when cutting thick stock with some other tools). However, if you don't have access to a band saw, or you need to make an interior cut (on the inside of a piece of stock, rather then cutting from the edge), there are a few different tools you can turn to. Each has its advantages and limitations. For many home woodworkers and DIYers, a jigsaw serves as a handheld version of a band saw (or, more precisely, a scroll saw, which is another option for curved interior cutouts). Jigsaws can make tight turns and cut a variety of stock thicknesses, even up to five inches. The trick to making interior cuts is to drill a starter hole, using a 3/8 or 1/2-inch bit into the cutout area. You then insert the jigsaw blade into the hole to begin the cut. The drawback of cutting thick stock with a jigsaw is that longer stock needs a longer blade, and a longer blade is more likely to flex during the cut, resulting in a cut edge that may not be vertical or as clean as you'd like. You can minimize flexing by using a larger blade, but larger blades don't turn as tightly as smaller blades, so there's an inherent tradeoff. As a general rule, the blade should be at least one inch longer than the thickness of the stock to make sure the blade clears the sawdust during the cut. Coping saws are special handsaws that cut very tight curves, usually in thinner stock, like trim molding. But they'll work in a pinch for outside (from the edge) cuts on reasonably thick stock; say, up to two or even three inches thick. Coping saws offer precise control, allowing you to nibble away the wood at your own speed. The drawbacks of coping saws are threefold. First, they have very thin, delicate blades that flex and break easily, so you have to be very careful to watch your line and keep the blade straight at all times. Second, the blade length is short, making for a short cutting stroke and consequently a lot of work for you. Third, the cutting depth is limited to the depth of the saw's frame (or the throat distance), and the frame often gets in the way when you're cutting parallel to the stock's edge. You can get around this limitation somewhat by making relief cuts to remove waste material as the curve progresses. Reciprocating saws are designed for demolition, not for woodworking, but for rough cuts in heavy stock, like landscape timbers or thick joists, they'll get the job done. The trick is to keep the blade speed up but advance the tool slowly, to prevent the jarring bouncing effect so familiar with these beastly tools. Just be careful not the let the blade overheat and burn the wood. Use a wood blade with a narrow profile that will allow for sharper curves. A router makes very clean cuts and can handle stock of varying thickness; how thick depends on the bit length and your comfort zone. Working with long bits calls for extra care and safety because long bits can flex and chatter if you push them too hard. In most cases, its best to make a rough cut with a jigsaw to remove most of the waste, then use a router to remove the last 1/16 inch or so. Hogging out a lot of material with a router is hard on the bit and the tool. 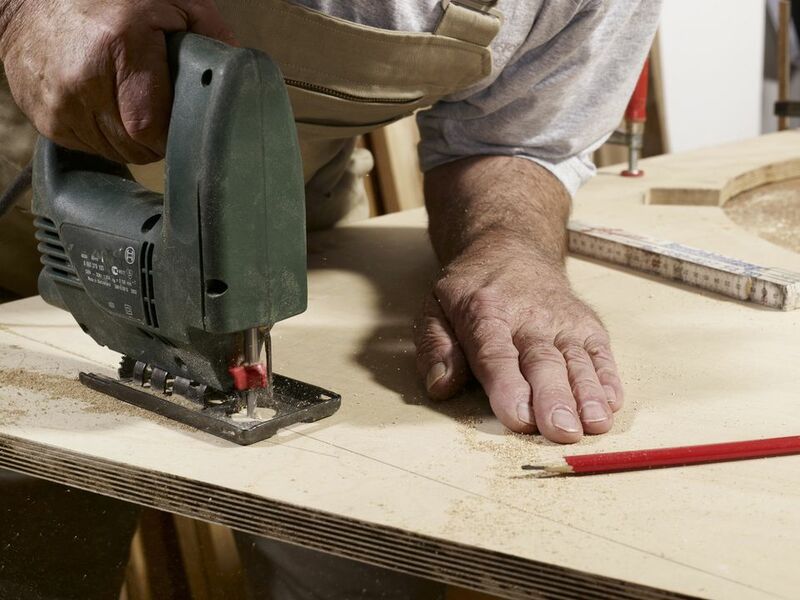 For the cleanest cut, create a template for the router to follow for the final cleanup.